The Middle East is a group of countries (see Middle Eastern Countries, below) that range from North Africa through Asia. You will find that many dishes have the same name across these Middle Eastern countries, yet they might taste entirely different based on the region. They can contain different herbs and spices (some with lamb and others with beef) or with cheeses instead of meat. These differences are driven by the availability of native ingredients, what was traded in the region and what was offered at the marketplace in the past. In essence, Middle Eastern food today is a culinary collage defined by its past. Olives, chickpeas, lentils, beans and vegetables are an important part of the cuisine of most Middle Eastern countries sometimes to the exclusion of meat. 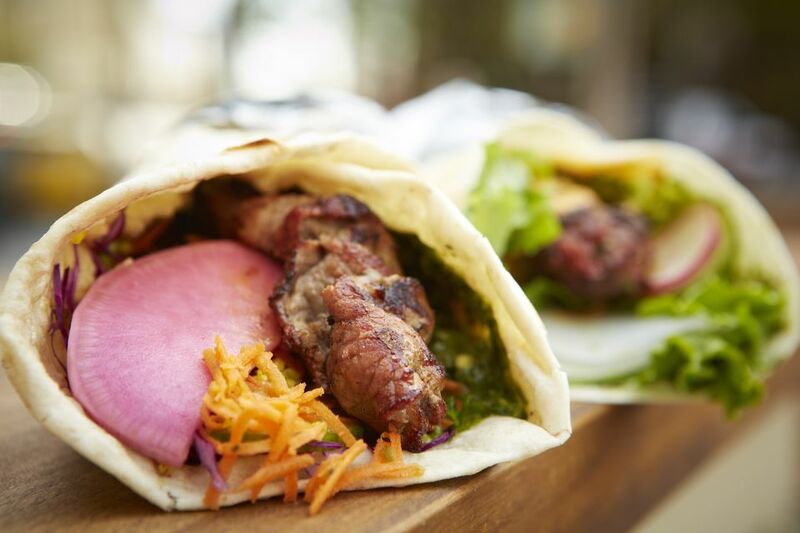 When meat is eaten, it is chicken, beef and lamb often skewered and grilled as kebabs. Yogurt and cheeses, along with legumes, make up the rest of the protein content of the diet. Pork and alcohol are prohibited in many of the countries because of religious dietary laws. Spices and herbs figure prominently and dishes are often strongly flavored with cumin, caraway, nutmeg, turmeric, mint, parsley and others. Flatbreads and pita in one form or another are two of the most popular types of bread served in many of the countries and used variously to wrap food in or pick food up with. Strong, thick Turkish coffee and tea are the most popular beverages. Middle Eastern food is versatile and most recipes are made with ease. While you may have trouble finding certain ingredients, there are online stores that sell imported herbs, spices, grains and other types of food. If all else fails, one of the great aspects of Middle Eastern cooking is the ability to substitute ingredients for what is available or for personal taste. Lamb can be substituted for beef and vice versa. Now with vegetarian ground meat in the freezer section at the grocery store, many dishes containing beef or lamb can become vegetarian! Spices like cayenne and cumin can be added for a spicier dish. The land mass that encompasses what is known as the Middle East is vast and there are many regions. The countries generally considered Middle Eastern include Algeria, Bahrain, Egypt, Iraq, Iran, Israel, Jordan, Kuwait, Lebanon, Libya, Mauritania, Morocco, Oman, Palestine, Qatar, Saudi Arabia, Syria, Tunisia, Turkey, United Arab Emirates and Yemen. There has been debate over whether Armenia, Afghanistan, Pakistan and Turkmenistan are considered to be part of the Middle East. Pita bread, one of the most popular Middle Eastern breads, is considered to be the oldest type of bread in the world. McDonald's has its own version of falafel on their menu in Egypt; it is called the McFalafel. Eggplant is the most-consumed vegetable in the Middle East. Ancient Egyptians used the herb fenugreek as embalming fluid. Today, fenugreek is used in cooking and in teas. The fava bean was once condemned because it was thought to contain the souls of dead people. Saffron is the most expensive herb in the world. By the time it hits the stores, it ranges from $600 to $1,000 per pound but is normally sold by the gram or ounce in markets.